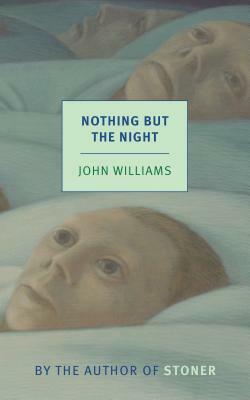 John Williams’s first novel is a brooding psychological noir. Arthur Maxley is a young man at the end of his emotional rope. Having dropped out of college, he’s holed up in a big-city hotel, living off an allowance from his family, feeling nothing but alone and doing nothing but drinking to forget it. What’s brought him to this point? Something is troubling him, something is haunting him, something he cannot bring himself either to face or to turn away from. And now his father has come to town, a hail-fellow-well-met kind of guy. They’ve been estranged for years, and yet Arthur wants to meet—and so he does, reeling away from the encounter for a night of drinking and dancing and a final reckoning with the traumatizing past that readers will not soon forget. This edition of Nothing but the Night includes an interview with Nancy Gardner Williams, the author’s widow. John Williams (1922–1994) was born and raised in northeast Texas. Despite a talent for writing and acting, he flunked out of a local junior college after his first year. He reluctantly joined the war effort, enlisting in the Army Air Corps, and managed to write a draft of his first novel. Once home, Williams found a small publisher for the novel and enrolled at the University of Denver, where he was eventually to receive both his BA and MA, and where he was to return as an instructor in 1954 and remain on the staff of the creative writing program until his retirement in 1985. During these years, he was an active guest lecturer and writer, editing an anthology of English Renaissance poetry and publishing two volumes of his own poems, as well as three novels, Butcher’s Crossing, Stoner, and the National Book Award–winning Augustus (all published as NYRB Classics). English Renaissance Poetry, edited by Williams, is also available from NYRB Classics.